Eberlestock Featherweight Rain covers are a compact and excellent addition to any pack. These backpack covers are designed to cover the entire pack and weapon that's being carried, or just the pack itself so that you can pull a gun from the scabbard. 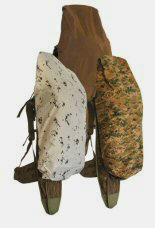 These covers go over packs that are fully expanded and loaded up, and can even cover a gun in the scabbard. You can alternatively leave the gun uncovered, in case you think you'll need it quickly. It also works well when the pack is compacted, because it has an aggressive elastic edging that pulls it tight around the pack. High quality polyurethane - coated nylon. Approximate weight is 4 oz.